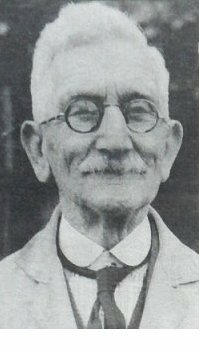 Herbert Edwin Higdon, known as Herbie, was born in Yeovil in the autumn of 1869 most likely at the Smithy in Tabernacle Lane where his father John George Higdon (1846-1875) lived and worked as a blacksmith. In the 1871 census 25-year old blacksmith John Higdon was listed living in Tabernacle Lane with his wife Ann (née Bird) and their children; Valentine G (b1866), Elizabeth A (b1868) and one-year old Herbert. John was listed as 'Blacksmith employing 1 Boy'. Sadly John Higdon died and Ann was left a young widow with five children to raise on her own - since 1871 John and Ann had two more children; Mary (b1877) and Sidney (b1880). Ann had to leave her home at the smithy in Tabernacle Lane with her children and in the 1881 census she was listed living at 13 South Street (which, from its location in the census records, would appear to have been on the corner with Union Street). Ann was working as a glover machinist, 15-year old Valentine was working as a solicitor's general clerk, 13-year old Elizabeth as a glover and 11-year old Herbert was employed as an errand boy in a glove factory. The following year 1882, allegedly at the age of 14 but actually barely 13, Herbert signed an apprenticeship indenture with James Bazeley Petter to learn the trade of a blacksmith and brightsmith (that is, a silversmith). Conditions of the apprenticeship were somewhat harsh by today's standards - he had to promise not to marry, not to play cards or dice and not to frequent taverns or playhouses. By the time of the 1891 census Ann and her children had moved to 66 South Street. Ann and her daughters Elizabeth, Annie and Mary were all listed as glover machinists while 21-year old Herbert gave his occupation as a blacksmith. In the winter of 1898 Herbie married Ada Louisa Pickard in her home town of Weymouth, Dorset, and they set up home at 32 Middle Street (below the Triangle) where, by this time, Herbie had started his own ironmongery business. In the 1901 census Herbert, Ada and their baby son, Herbert Pickard Higdon were listed as living above the shop together with a domestic servant. Altogether Herbie and Ada were to have three sons; Herbert Pickard (1899-1903), Alfred Pickard (1906-1991) and Howard Pickard (1909-1992). In the census Herbie listed himself as an employer and gave his occupation as 'Ironmonger, Engineer & Shopkeeper'. In Collins' Yeovil Directory of 1907 Herbie had three separate listings; as a Gas Fitter & Plumber of Middle Street and as a Tin Worker of Middle Street. Finally, and perhaps surprisingly, as a Farrier & Shoeing Smith of Middle Street. Indeed horses were led through the shop to Herbie's smithy at the rear of the premises where they would be shod - at two shillings and sixpence (12½p) for a set of four shoes. In 1914 Whitby's Yeovil Almanack Advertiser listed him as an Ironmonger of Middle Street as did Kelly's Directory of 1919. Edwin Snell's Directory of 1954 listed the business as Higdon & Son, Ironmongers & Hardware Merchants of 32 Middle Street. It was also rumoured that Herbie could open any safe if you had lost your keys! 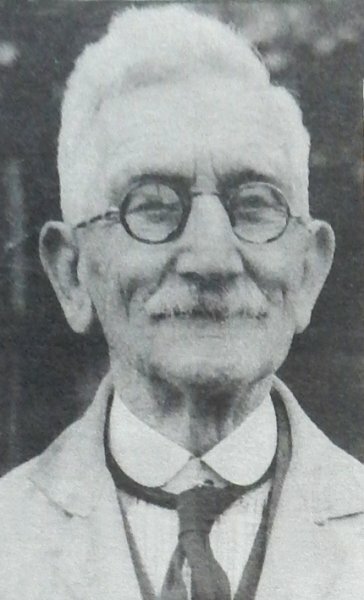 Herbie was a keen sportsman and cyclist and was a pioneer of cycling in Yeovil and was known to have ridden a penny-farthing. However, he was the first to bring the the safety bicycle to the town and he is also credited with the introduction of the first machine with pneumatic tires. 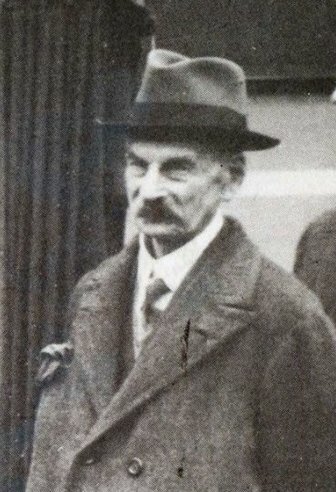 He also maintained an interest in local politics, being elected to the town council and eventually being appointed an alderman. When Herbie finally retired he moved to Flat 3, Braggchurch, on Hendford Hill, where he died on 30 March 1956, aged 87. His will was proved at Winchester in June of that year, his effects amounting to £96 16s 4d (around £5,000 at today's value). The family business was continued by his son Howard who modernised the shop in 1956 (the work carried out by the firm of Hammer & Scoggs) and created the slogan "Everything Electrical". The shop finally closed and the building demolished for the Quedam project. This map of Tabernacle Lane is based on the 1886 Ordnance Survey, but rotated 90° with the Borough at extreme left and South Street at extreme right. 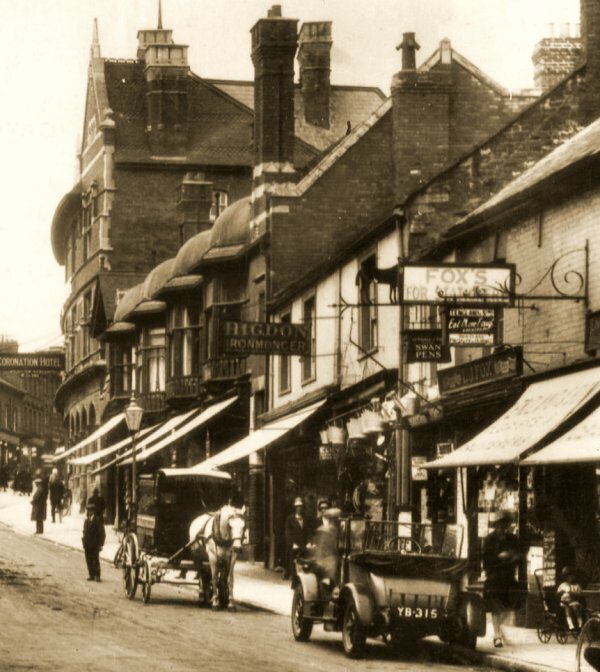 The dwellings in Tabernacle Lane included those behind the Greyhound Hotel since the dwellings in Greyhound Court were just off the bottom of the map. Herbie was most likely born in the smithy (towards top left) where his father was the blacksmith at the time of his birth. 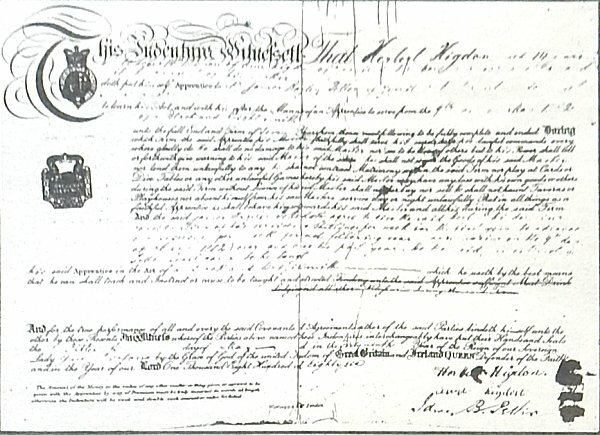 Herbert Higdon's apprenticeship indenture of 1882, signed by both Herbert and his new employer James Bazeley Petter. 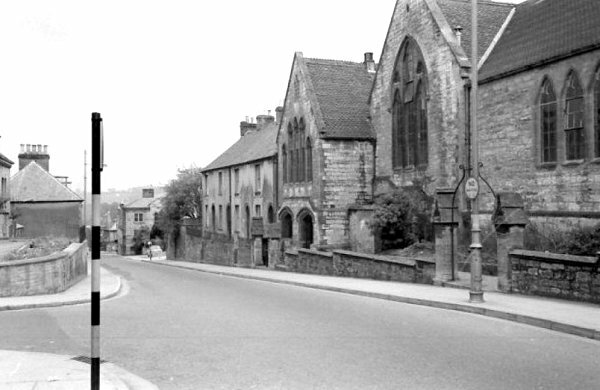 A photograph from the 1960s, just a few years before demolition, showing the location of the school in South Street, opposite the Union Street junction seen at left. One of the cottages seen here just left of centre, next to the South Street School, was home to Herbert in the 1890s prior to his marriage. 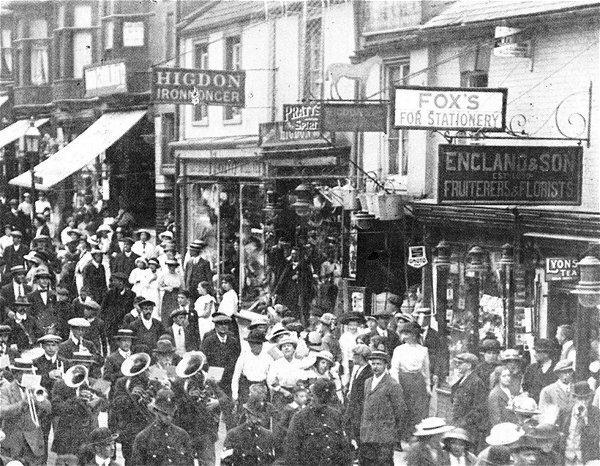 Volunteers led by a band march past Herbert's shop in August 1914. 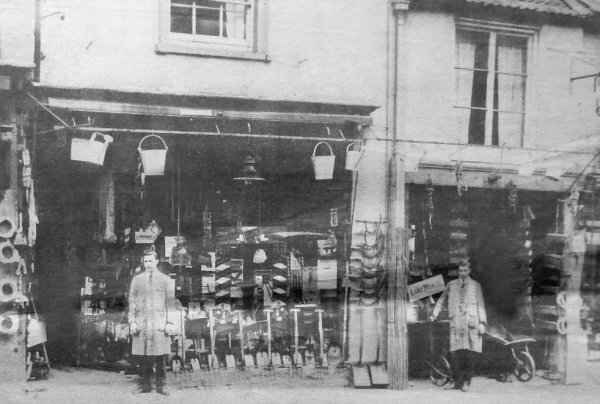 Herbie's ironmongery, at centre, probably photographed in 1923 (when Mary Slann was running the Coronation Hotel a few doors along) before he expanded his business by taking over the neighbouring premises of Lyndall Fox. An enlargement of the previous photograph. Herbert Higdon's shop in Middle Street, possibly photographed in the 1950s after the business was extended into the adjoining property. Most likely Herbert's son Howard standing at left. 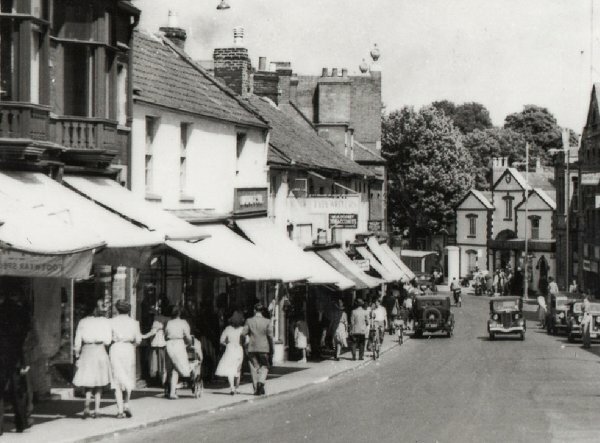 Herbie's ironmongery left of centre, now Higdon & Son, photographed in the early 1950s. At right, the three-gabled building was the gasworks offices (now the St Margaret's hospice outlet). Why don't all shops have awnings these days? The 1956 overhaul of the shop front and interior. 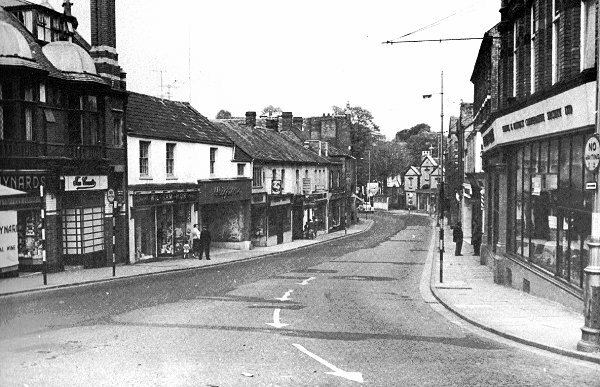 Looking down Lower Middle Street, remarkably traffic-free in the late 1960s. 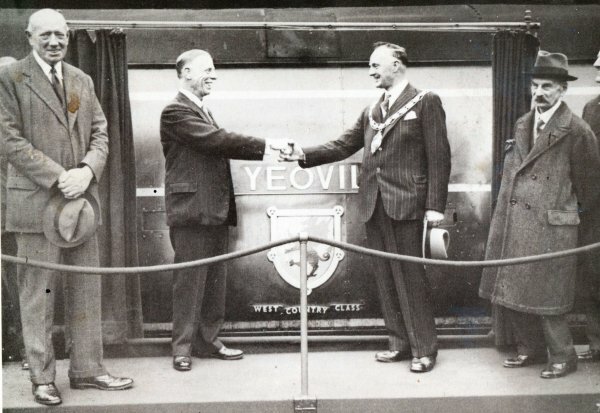 At right is Jesty's store, by this time Yeovil & District Co-operative Society's furniture branch store. 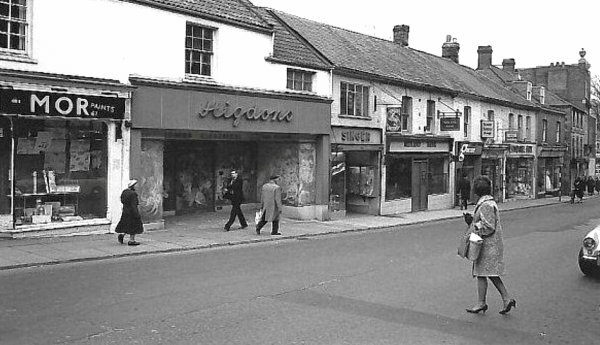 Higdon & Son's premises, left of centre, now has the new shop front put in by Howard in 1956. 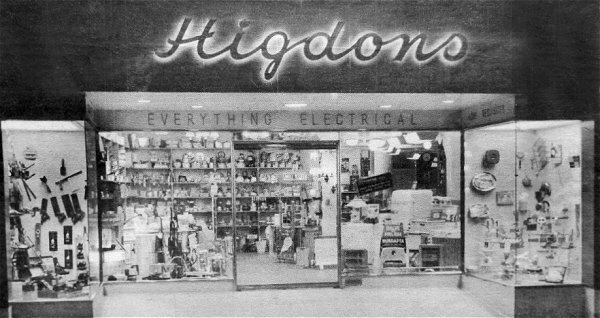 Higdon's new shop front seen around 1960.